Published July 16, 2014 By Anna T. This post may contain affiliate links. Regardless, I only recommend sites I've researched and/or used and trust. Way With Words is an international company that has been in business since 2001. 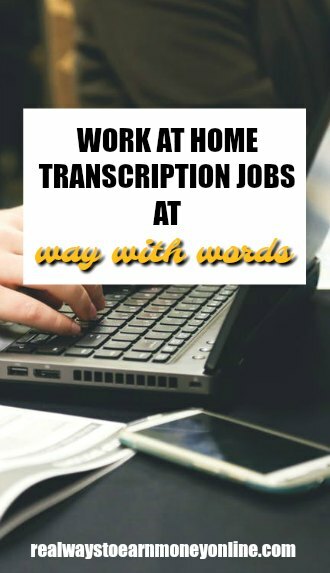 They hire people to work from home doing all sorts of transcription including medical, legal, entertainment, market research, and more. In addition to transcription, they also hire captioners, translators, and copy typists, but this review will focus on the transcription job. How much does Way With Words pay? They pay between $33 and $57 per audio hour. The website explains that new transcribers start off at $33 and can earn up to as much as $57 per audio hour depending on their level (skill and experience). If you know transcription, then you know their rates are on the low end compared to most transcription companies, particularly their beginning rates. It could take you quite a while to transcribe an hour of audio depending on how difficult your file is. It is not uncommon for it to take four hours to transcribe one hour of audio, so at a rate of $33 per audio hour, you'd be making roughly $8.25 an hour. I believe Way With Words pays workers via direct deposit once per month. Is Way With Words open worldwide? Yes, this company uses transcribers from all over the world. You need a computer equipped with high-speed internet and the Microsoft Word program. You will also need to have MSN messenger downloaded onto your computer so you can stay in touch with Way With Words in case there is work for you to do. They prefer highly skilled, experienced transcribers. Way With Words makes it very clear on their website that most people who apply and test do not make it in. Only two to four percent of applicants do well enough on the tests to become transcribers for Way With Words. Apparently the testing process can take up to two weeks or even longer. If hired, Way With Words asks that you commit to doing at least one hour of audio per day, preferably more. You work for Way With Words as an independent contractor. What is the overall feedback on Way With Words? This is where it gets interesting, and I'll have some posts to link below. When I started researching this company, I found that (as stated above) most people absolutely do not make it in. But I figured it may be worth having the info on here anyway just in case someone comes across the company and wants the details on them before applying. Way With Words makes you go through a fairly complicated grammar test and also transcription tests with really, really difficult audio. Many people who consider themselves to be extremely competent transcribers and English pros have failed to get in here. There is a blog post here with warnings about Way With Words. Both it has a ton of interesting comments on it, most from people who have been rejected and a few from people who actually claim to be current or former workers for the company. You may also want to read this post on the Way With Words blog. It explains why they are so selective in their hiring process. I do not believe this company is any sort of scam. However, I'm not sure it's a good option for a transcription job when they pay so low and demand such a level of perfection from potential workers. Most of the time when transcription companies pay on the lower end, it's a little easier to get in. Also, I've been reading that the testing process can take weeks or even months to get through. I am not sure if Way With Words compensates applicants for test files, but my guess is they don't. When you know that chances are better you won't make it in, that seems like an almost-guarantee of much wasted time. Are Way With Words workers happy with the job? If the testimonials on the company blog are to be believed, there are some satisfied workers. If you like a challenge and want to apply, you can go here to get started on the application process. Want to try transcription but don't think this company is for you? Browse my big list of other legit transcription companies here. When the hire you they email an information packet with instructions on how to log in to look for available transcription projects that need to be completed, as well as how to add them on Skype so they can contact you about projects. I would log in to check for assignments but there was never anything listed. No one ever attempted to reach me via Skype or email either. At the time, I was working for another company and sort of put WWW on the back burner for the first couple of weeks, assuming that they would contact me if there were projects to be completed. I tried to log in to check for work in April, but kept getting blocked by an error saying that my profile was inactive. This is when I first began thinking I’d been scammed. I sent an email asking about it and several days passed without a response. Just when I was ready to contact authorities (since submitting a birth certificate is part of the application process), I received a response that claimed I’d never responded to their messages about work and they’d assumed I was no longer interested. (Just so we’re clear, I never received ANY messages from them.) They did offer to reinstate me if I was able to pass the transcription test a second time, so I decided to wait to file a complaint. The new transcription test is completely different than the test I took when I first applied. I’m actually thinking almost anyone should be able to pass now since it’s just a multiple choice quiz. I received my results about a week and a half later, and almost immediately was offered work. I’m still working another job, so to date I’ve only elected to receive four hours of audio. Aside from the first project, all the assignments so far have all had ten-day deadlines. It didn’t occur to me to track my time while I was working, so I can’t tell you how long it took for me to complete a single hour of audio. I can say that my time is not quite what I’d like it to be to make the $.35/hr worth it. I did specifically ask one of the ladies about it this though, and she said that their better transcribers can bang out an hour’s worth of audio in about two hours, really good ones can do even better. She assured me that most people brand new to transcription like me will start out considerably slower but will begin to see marked improvement over the course of a month or two. With enough practice and the right equipment, a novice transcriber could become a really great transcriber in no time… According to her. 🙂 I’m going to see how it goes for a few more projects. I won’t stick around if it’s not worth it. The two ladies I’ve been in communication with are both really pleasant and friendly, and there doesn’t seem to be any shortage of work. All in all, it seems like it’s a great place to work if you can transcribe ridiculously quickly, otherwise the $.35/min might not be worth it. Also to be noted, you only get paid once a month so if you’re not accustomed to that then this really might not be for you. Anyway, I just wanted to come back to update my previous post! Thanks Melody, I really appreciate your coming back to share an update with us. I didn’t find the tests to be difficult at all. I felt the assessment file posed a slight challenge, but only because I’ve never done any transcription work and I was being extremely careful to capture everything I heard and record it exactly as specified in the guidelines. (My audio file had three speakers to be included in the transcript and parts where there was background chatter or cross talk, but the file was simple enough to transcribe.) I received my congratulatory email only a few days ago and haven’t received any actual assignments yet, so I’m not sure whether to be excited to have WWW as a side gig or to be concerned that strangers on the other side of the planet have my personal information. I found this site by searching to find if others felt WWW is a scam, so it was a small relief to read that others have also been “hired”; the jury’s still out though since it doesn’t appear anyone else has made it past the “You’re hired, now what?” stage. I’ll be sure to post an update if things change (or don’t) in the coming days. Good luck, please come back and let us know how it goes. I was recently hired and didn’t find the tests too difficult (although I did graduate with a B.S. in English, so I’m already a bit of a nerd). The assessment file was really tough, and since I have little to no experience, it took me a while before it “clicked” in my head. Lately, I haven’t had more than a couple hours to do every few days because of the short deadlines. Once they get files, they contact you asking how many hours you can complete before their given deadline. The files I transcribe are much better quality than the assessment file, for sure. I enjoy the work. I applied back in September and they replied this week. It was an offer to work for a ‘Special Interest Project’ that was running for just one week. They sent a file for me to transcribe as part of the overall assessment for a position with them (beyond the special project). The audio file wasn’t bad at all. The people speaking had a British accent, but I didn’t find it difficult at all. I studied dialects in acting school so maybe that helped? It took me about an hour to transcribe 3.5 minutes of audio, being sure to follow their instructions explicitly for fear of having my application “deleted immediately without explanation” if I failed to do so. The email said that I would be paid at a rate of .35 per audio minute and if I pass the assessment I will be sent jobs in batches of approximately an hour. So I sent in the transcribed file along with my ID as requested. I will write back if I get the job. I did a great job transcribing, but I am cautiously optimistic as I see from the review that others thought they did well too and didn’t get it. So, I read this and decided to give it a try. I’m a Spanish transcriptionist. So I sent an e-mail application two days ago, they answered me providing an audio of 5 minutes to transcribe as a test. I did the transcription, and today they sent me another mail notifying me that I passed the test. Now I just sent them my personal details so they can send me a contract. So far, I haven’t encountered any difficulties which are mentioned through the application process. I’ll let you know how everything goes. Many thanks, Anna. Even though I haven’t signed the contract yet, this is the second job opportunity I get thanks to this blog 🙂 -The other one isn’t going too well but I’ll comment in a few days in its own article-. Great info! I passed the grammar test but an now apprehensive to proceed with the transcription test. The grammar test was a bit tricky since it was based on the British English language. Good luck if you decide to attempt it, Lynn. Definitely come back and let us know how it went if you do it.